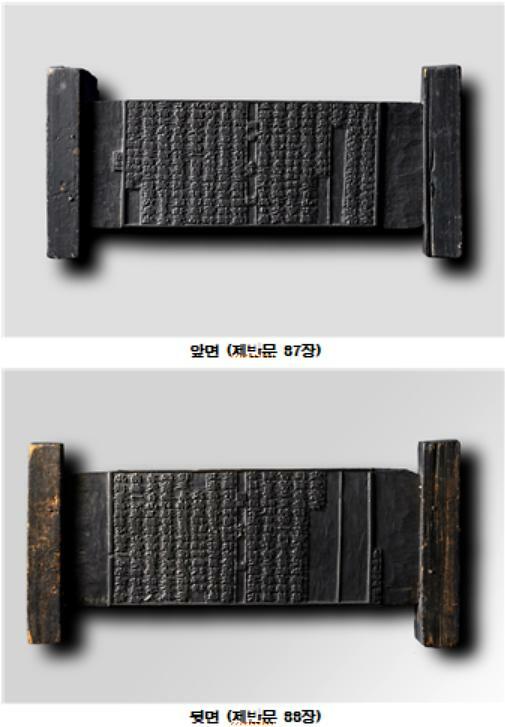 SEOUL -- A precious 17th-century wooden printing plate which contains a Buddhist scripture was displayed in a public place, 65 years after a 92-year-old former U.S. Marine officer took it home. The scripture described Buddhist rituals. Richard Rockwell living in Seattle collected the plate when he went on a reconnaissance mission to Sinheung Temple at Mount Sorak, some 210 kilometers (130 miles) east of Seoul, in October 1954. He found the plate through the debris of the temple destroyed during the Korean War and took it home. Rockwell, who had always thought the plate could be an important cultural asset, contacted a city museum in the eastern port city of Sokcho in January 2018, offering to donate the plate and 279 slide photographic films which contained images of South Korea in 1953 and 1954. The museum immediately dispatched a specialist to Rockwell's home. After a close examination, the plate was found to be an authentic chapter from a series of Buddhist printing plates, which were presumed to have been made in the mid-17th century. In February, Ahn Min-seok, a ruling party legislator who chairs a parliamentary committee, and Jisang, a Buddhist monk, visited Rockwell to express gratitude. The returned plate was put on display in the Sockcho museum from Tuesday.